Anita’s Kitchen Ferndale review, pics, hours, and menu info. 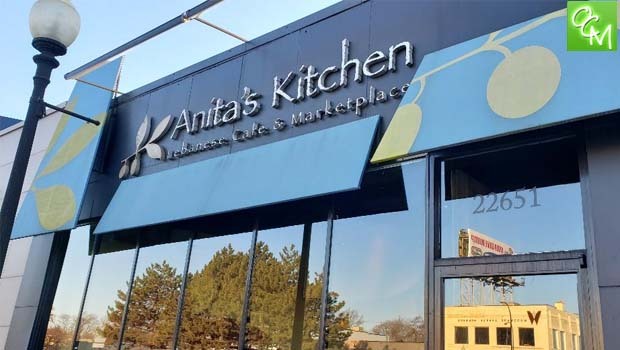 Anita’s Kitchen in Ferndale is located right off Woodward Ave just south of 9 Mile Rd. I’m a big fan of Middle Eastern and Mediterranean foods. Recently, I was visiting my niece to celebrate the purchase of her first home and I offered to bring over some take out. I immediately thought of Anita’s Kitchen because I had not tried it yet and I saw that it had good reviews online. I called in the order and the staff was friendly and helpful. We received a text once our order was ready for pickup. It was a somewhat large order (5 meals), and they were able to get it done really quick. Then menu at Anita’s Kitchen is loaded with Middle Eastern favorites – hommus, falafil, fattoush, shawarma, kafta, kibbeh, kebob, stuffed grape leaves, gyro, and more. I love this type of food because it’s healthy and tasty. I don’t like to write bad reviews, but I have to say that this was not good food. In all honesty, it ranked as the worst Mediterranean food I’ve eaten. We ordered the Chicken Shawarma dinner, sandwiches, and salads. The chicken was supposedly “grilled.” I love the Middle Eastern style marinated chicken that is grilled. It’s full of flavor and super juicy. However, at Anita’s Kitchen, this chicken didn’t even look grilled. It was extremely dry and coated in some kind of seasoning. It didn’t seem like it was cooked fresh. I wonder if that’s how they were able to cook it all so quick? Also, there was no juicy flavorful marinade; all I could taste was salt. Everything in my order was extremely salty, and that’s saying something from someone who considers herself a salt-a-aholic. My sister even commented that the salad tasted salty. Maybe the restaurant has recently changed? I honestly don’t know how it got such good reviews. You can tell by my photo that this doesn’t even look like grilled chicken breast pieces. I don’t want to deter anyone from going as it did get some good reviews. Maybe I tried the wrong dishes? Maybe it was a bad night? But, for me, it’s not worth it to go back. I prefer every other Mediterranean restaurant that I’ve been to over this one. The other restaurants I’ve been to were prepared authentically by the families that own them. In this case, it seems like Anita’s Kitchen got so busy they’re just hiring anyone to cook these meals and there’s no authenticity behind them.